The World Health Organization estimates that 25 percent of common cancers can be prevented through regular physical activity and weight control. Common cancers linked to overweight/obesity and a sedentary lifestyle include breast, colon, endometrium, pancreas, renal, esophageal, and several others. 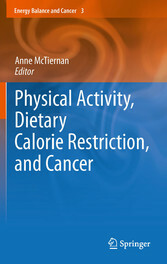 There are several plausible mechanisms linking lack of physical activity and increased adiposity to cancer risk, supported by results from animal experiments and human intervention studies.